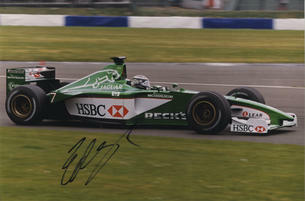 This is an In Person signed Colour 12" x 8" Photo of the retired Formula 1 Racing Driver. Edmund "Eddie" Irvine, Jr. (born 10 November 1965) is a retired British racing driver from Northern Ireland. He was the runner-up in 1999 Formula One World Drivers' Championship, driving for Ferrari. Irvine was influenced by his parents to enter motor racing. He began his career at the age of seventeen when he entered the Formula Ford Championship achieving early success, before progressing to the Formula Three and Formula 3000 Championships. He first drove in Formula One with the Jordan team in 1993 season, where he achieved early notoriety for his involvement in incidents during his early career. He clinched his first podium finish in 1995 before moving to Ferrari in 1996. His most successful season was in 1999 when he took four victories and challenged McLaren driver Mika Häkkinen for the World Championship, eventually finishing the runner-up. He moved to Jaguar in 2000 and endured poor results but managed to clinch his team's first podium in 2001 and another podium in 2002. Irvine left Jaguar due to friction within his team and announced his retirement from competitive motorsport when he did not secure a race seat.